Learn the Lima stemmed SMR reverse geometry shoulder replacement (nickel free implants) surgical technique with step by step instructions on OrthOracle. Our e-learning platform contains high resolution images and a certified CME of the Lima stemmed SMR reverse geometry shoulder replacement (nickel free implants) surgical procedure. Reverse geometry configuration total shoulder replacements are in widespread use for the treatment of patients with rotator cuff deficient shoulders associated with significant arthritic change, known as cuff tear arthropathy. 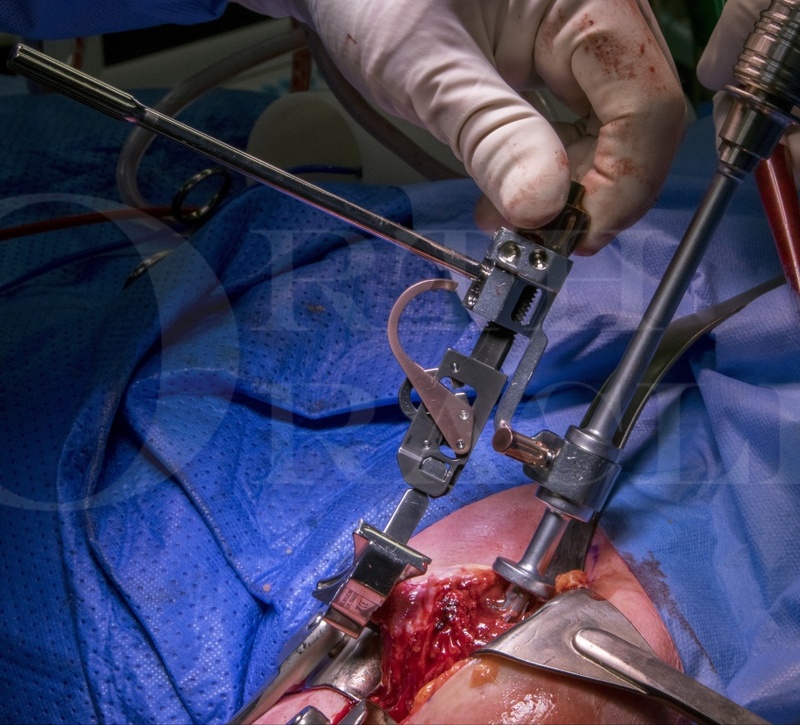 Such implants have also been used in the management of patients with irreparable proximal humeral fractures, a technique which has been described elsewhere in Orthoracle. The design rationale in placing a prosthetic ball on the glenoid (the glenosphere) and a socket on the humeral side in a semi-constrained construct, is to medialise the joints centre of rotation and so increase the moment arm of the large deltoid muscle. This potentially optimises its function in the absence of the deficient rotator cuff tendons. Many companies have developed such shoulder replacement implant systems. In this case, I am using the stemmed reverse geometry system, known as SMR from the Italian company Lima. The patient in this case is a female in her 70s, who presented with pain and disfunction in her non dominant left shoulder. Clinical assessment and investigations revealed a rotator cuff tear arthropathy. She had exhausted conservative measures and felt that her shoulder was bad enough to consider major arthroplasty surgery. During her history, she revealed that she had a significant allergy to nickel. Whilst there is little evidence that patients with nickel allergies or sensitivities have significant reaction to orthopaedic implants containing nickel, this is a risk to which the patient does not need to be exposed. In the standard Lima shoulder replacement implants, the cobalt chrome components do contain nickel, although this is less than 1%. The Lima system does have options to avoid using any nickel and the implants used in this case are titanium, with a polyethylene humeral insert. Author : Mark Crowther FRCS (Tr & Orth). Institution: The Avon Orthopaedic centre, Bristol, UK.